D-1105, White Color, Hindu Cards. The front of this card has self-embossed border design with a solitary kundan dot. The image window in the center has the paste-ups with a multicolored image composition of Ganesh ji having beautiful kundan work on it. 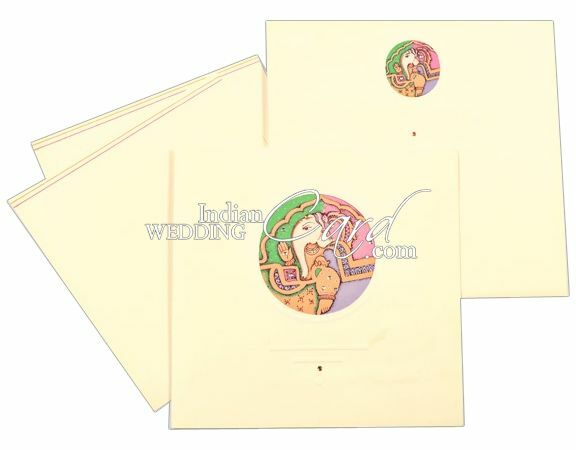 The docket has the paste up in the form of the dholak and shehnai images in multicolored setting, which also has kundan work on it. The inserts have borders in peach and ochre. The envelope follows the front. 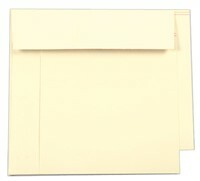 Natural shade – white paper, Docket style card with transparent polythene film and white paper paste-ups, 2 inserts and envelope (200gsm each) with silken ribbon for docket having paper cut out pasted on it.